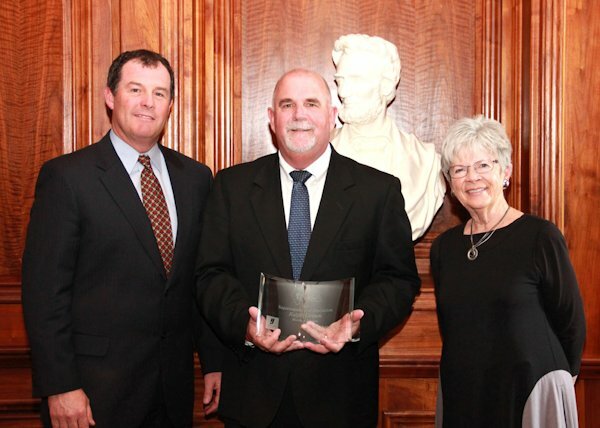 at an awards luncheon Tuesday (April 21) at the governor's Executive Mansion in Springfield. Grimm was selected by his peers in the Illinois Association of School Administrators (IASA) Western Region. said Grimm, who has been an educator for 31 years, the last 10 as superintendent of West Central Community Unit School District 235 in Biggsville. He recently was named superintendent of Galesburg District 205, where he will take over July 1. Grimm was one of 20 school superintendents from around the state to be recognized as a Superintendent of Distinction. Governor Bruce Rauner and IASA Executive Director Brent Clark were among those taking part in the awards ceremony. Grimm attained his Bachelor's Degree in Education and his Master s degree in Education Administration from Illinois State University and his Certificate of Advanced Study from Western Illinois University. He was a teacher, coach, athletic director, dean of students and principal before becoming superintendent at Carthage in 1993 and Canton in 1999 before becoming superintendent of the West Central district in 2005.
" Successful completion of the installation of a water line to the district's north campus that has improved the quality of water as well as providing enough water capacity to fight a fire on the north campus should the need ever arise. Grimm and his wife, Susan, have three sons, Kevin, Daniel and Jared. The awards and luncheon were sponsored by Horace Mann, one of the nation's largest insurers focusing on educators' needs, and Herff Jones, one of the largest suppliers of class rings, yearbooks and graduation caps, gowns and announcements. said Marita Zuraitis, Horace Mann President and Chief Executive Officer. Their efforts make their schools outstanding learning environments, and that excellence is what the IASA is celebrating. Horace Mann is proud to recognize and applaud the IASA Superintendents of Distinction. said Sales Representative Elizabeth Elsner. Pictured from left are IASA Executive Director Dr. Brent Clark, Superintendent Ralph Grimm of Biggsville, and State Board member Melinda LaBarre.